Cultural intelligence is a framework to help you learn to turn off your “cruise control.” Like a computer that has been on too long, is working too hard, or has too many programs running that cause it to freeze, we have to learn to reset our mental programming. Sometimes, resetting it once or twice does not work; you will need to turn it off completely by taking a pause and then returning to it at a later time. Cultural intelligence emphasizes three areas: metacognition and cognition, motivation, and behavior. Metacognition and cognition represent your ability to think, learn, and strategize. In CI, the principle of motivation refers to your self-efficacy and confidence, your ability to be persistent, and the alignment to your personal values. Behavior, in CI, is about your ability to have a repertoire of skills and your ability to adapt your behavior. The framework for cultural intelligence consists of the following parts: knowledge, strategic thinking, motivation, and behaviors. 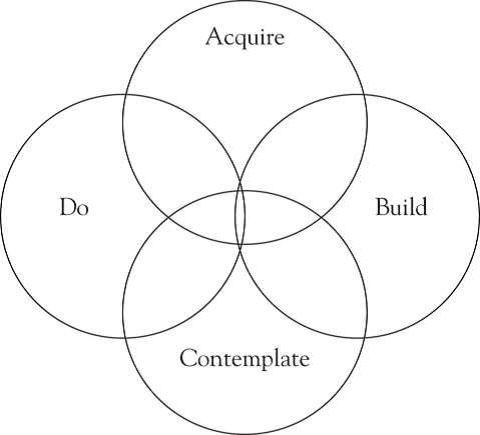 It may be helpful to think about these as the ABCs of CI: Acquire, Build, Contemplate, and Do.